The second of only two road course races on the 2011 NASCAR Sprint Cup Series schedule, the Heluva Good! Sour Cream at the Glen runs accommodates the heavy stock cars for a 25th consecutive year. Regular drivers routinely face-off with specialists of the twist and turns of Watkins Glen International. The 2011 event was no exception as Ron Fellows, Boris Said, as well as road racing proficient Cup regulars Marcos Ambrose and Juan Pablo Montoya will be presenting an opportunity to dominate. Strong opponents against the primarily oval-based drivers, the competitive gap between Sprint Cup regular and Road Race Ringers have long been narrowing making 90-laps at the Watkins Glen course an eagerly awaited affair. 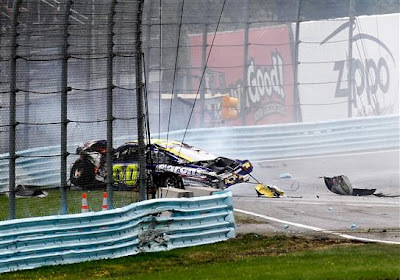 Running one day late to due a significant downpour flooding the Watkins Glen race track on the scheduled Sunday date, the 43 NASCAR Sprint Cup stock cars raced early Monday morning at the former Formula 1 US Grand Prix circuit. The Heluva Good! Sour Cream Dips at the Glen started with Richard Petty Motorsports Ford getting the better of the pole-winning Joe Gibbs Racing Toyota piloted by Kyle Busch. Taking the lead by the first lap, the #43 of AJ Allmendinger advantage was gained through his front row starting position. Formerly an open wheel racing star, Allmendinger spent the early stages in the first place position until his teammate Marcos Ambrose snatched the lead away on lap 9 at Watkins Glen. Winning the NASCAR Nationwide Series event at Watkins Glen three year in a row, Tasmanian native Ambrose time in the stock car racing series has seen the road racing specialist grow as an oval racer. However, driving the #9 Stanley Tools Ford Fusion, Marcos Ambrose's talent racing tracks like Watkins Glen makes him a real favourite for a first victory. While Kyle Busch was bested by the Richard Petty Motorsports cars early in the run, the M&Ms Toyota roared back to the lead for lap 17 getting around the #9 of Ambrose who had pitted early. Most competitors in the Heluva Good! Sour Cream Dips at the Glen race chose to make the 90-lap distance on just two pit stops. In essence running 30 laps per every full tank of fuel, the plan proved too Sticking to a plan to run the race with a three-stop strategy, the #9 Richard Petty Motorsports Ford Fusion could focus on setting fastest lap times on the Watkins Glen circuit. As the Fords of Richard Petty Motorsports devoted themselves to a safer fuel strategy, the Roush/Fenway Racing Ford Fusions are along many who pushed for lap 30 to make their first fuel stop. For the team's #16 car of Greg Biffle, the fuel cell on his stock car ran dry after 28 laps. Slowing and eventually stopping on track, the Heluva Good! Sour Cream Dips at the Glen first caution was deployed. While the Roush/Fenway Racing car of Greg Biffle received a push back to the pits on a fellow Ford, the timing of the caution was a benefit to some drivers including Marcos Ambrose and Dale Earnhardt Jr who had made pit stops during the green flag. For a second time, Ambrose led at Watkins Glen before turning the position over to Juan Pablo Montoya's #42 Chevrolet. Taking the lead on lap 37, Montoya stayed out front for 3 laps. After Juan Pablo Montoya's time at the front, fellow Chevrolet driver Jeff Gordon took over until the #18 Toyota of Kyle Busch swept back into the top spot on the 45th lap. Slowed first by a stopped vehicle on track, the next series of cautions during the Heluva Good! Sour Cream Dips at the Glen involved dramatic collisions. As Kyle Busch was putting a driving clinic at the front of the field on lap 48, the #22 Shell/Pennzoil Dodge piloted by brother Kurt Busch plowed hard into the turn 5 tire barrier. Ending in a retirement for the Sprint Cup chase hopeful, Kurt Busch was not the only member of the NASCAR Sprint Cup's top-12 in points to meet the Watkins Glen retaining barriers. On lap 67, Denny Hamlin went for a frightening ride when his Joe Gibbs Racing #11 Toyota sailed straight in turn 1. A product of a stuck throttle, Hamlin was unable to slow down the stock car from over 100 mile per hour. Only the turn 1 tire barrier and wall could stop the speeding FedEx #11 Toyota. Enduring a hard hit, Denny Hamlin (like Kurt Busch in the previous crash) left the vehicle thankfully unhurt. After the Hamlin crash, green flag was shown with 20 laps to go for the Heluva Good! Sour Cream Dips at the Glen NASCAR Sprint Cup event with Kyle Busch taking the race lead back from Jeff Gordon. Building up a sizable lead on second place Marcos Ambrose, Kyle Busch's advantage was erased on lap 87 by the backstretch crash of Paul Menard's #27 Chevrolet. The Heluva Good! Sour Cream Dips at the Glen race came down to a final showdown between the two most superior race cars of the day. In the lead, Kyle Busch faced off with the #9 Ford of Marcos Ambrose for what would be the race's green-white-checker finish. Side-by-side, Busch and Ambrose launched with near identical restarts. Into the corner, the #2 Dodge of Brad Keselowski entered into the battle for the Watkins Glen lead. Kyle Busch bobbled slightly as Keselowski pointed his car perfectly into the first corner taking the top position. While Busch quickly settled his vehicle, the #18 Joe Gibbs Racing driver was effectively out of contention for the NASCAR Sprint Cup victory. Marcos Ambrose remained close to the new leader Brad KeselowskiHeluva Good! Sour Cream Dips at the Glen. In second place, Marcos Ambrose found considerable speed through the back straight portion of the track in the #9 Ford to pass the #2 Dodge through the Watkins Glen's inner loop section. As Marcos Ambrose crossed the start/finish line with a commanding lead at this vital time, the Tasmanian should only need to worry about the competition for about half of the final lap. Bringing out the race solidifying caution, a violent wreck involving three cars provided a dramatic conclusion. The major incident started in turn 1 as the #6 Ford of David Ragan was sent wide into a wall in turn one. Striking the wall hard with an uneven front impact, the Ragan's Ford bounced back into the race track and slammed the #00 Toyota of David Reutimann. Impact on Reutimann's car sent the Michael Watrip Racing Toyota for the wildest impacts first into the inner wall. Hitting the steel barrier, the force of the #00 car's impact sent the vehicle onto its side and later roof as it slid into the outside wall. The #36 Chevrolet of Ron Fellows was also clipped in the incident ending what was a difficult day for the Canadian road racer. Thankfully ending the race on a positive note, Fellows, Ragan and Reutimann walked out of their cars without serious injury. Due to the last lap caution, the #9 Ford crossed the finish line under the yellow flag to win the Heluva Good! Sour Cream Dips at the Glen. Rewarding the relatively sizable NASCAR race crowd returning to the rescheduled Monday morning event at the 2.45-mile road course, Marcos Ambrose lit up his tires in celebration of his first NASCAR Sprint Cup victory. The victory for Richard Petty Motorsports #9 car of Ambrose comes almost two years since their last win with Kasey Kahne at Atlanta Motor Speedway. The Richard Petty Motorsports win at Watkins Glen is also the first with a Ford product in NASCAR Sprint Cup competition. The term 'first time winner' has become a refreshingly more common on the 2011 NASCAR Sprint Cup Series with Marcos Ambrose's name joining Trevor Bayne, Regan Smith, David Ragan and recent Brickyard 400 winner Paul Menard. Brad Keselowski finished 2nd at the Watkins Glen road course still enduring pain suffered in a Road Atlanta crash weeks before. Bringing the #2 Miller Lite Dodge of Penske Racing home in the runner-up position served as come much-needed medicine as Keselowski attempts to gain a spot in the 2011 Chase for the Sprint Cup. Though Kyle Busch missed out on the race victory, his third place finish locked the Joe Gibbs Racing driver into the top spot in the 2011 NASCAR Sprint Cup driver points. Toyotas of Martin Truex Jr and Joey Logano rounded out the top-five for the Heluva Good! Sour Cream Dips at the Glen. The next stop for the NASCAR Sprint Cup Series is a second visit to the 2-mile Michigan International Speedway Sunday.